"I had nothing to do with what happened," said Raas, who succeeds Gerrie Knetemann in the rainbow jersey. "In the finishing sprint Thurau started the move and I had to follow." Early in the race Raas had been picked out by the TV cameras taking tows from his team-mates on the Cauberg, saving strength for later. "Everybody does it," he explained. "Just because I was Dutch and the race favourite, the camera picked me out. Raas had every incentive to win the title. A great friend of Knetemann, he has three times won the Amstel Gold classic, including this year's event which regularly uses the Cauberg, one of the climbs on the Valkenburg circuit. The 26-year-old from Zeeland had another very good reason, too. He had asked for big money from TI-Raleigh for next year, to which they had agreed only if he won the world title - a bargain struck, a promise kept. It was a typical world pro title race, with an early breakaway allowing plenty of freedom, followed by a few preliminary skirmishes, then the real race over the last 50 miles. And what a race it turned out to be! Britain's contribution was two-fold: an early break by Yorkshireman Dudley Hayton, 70 miles in front at a more than respectable pace, and a gutsy ride by Keith Lambert, our only finisher, in 26th place, after being in the wrong half of the bunch when the vital split came, two laps from the end. It was cold and misty as the 115 strong bunch climbed from the Valkenburg start up the Cauberg for the first time, with 17 full 16 kilometre laps to follow. Rain threatened to dampen the roads still further, and duly did for a while, but for the last half of the race the sun shone on the dwindling field and an estimated 250,000 watchers. Britain's Paul Sherwen was in a short-lived break on the first lap but on lap two came the move which was to provide the first half with all its interest. Frenchman Martinez attacked and was chased by Hayton, then punctured, leaving the Briton alone, with the rest of the field behind. By the end of the lap he had 4 seconds, then two minutes a lap later. By the end of the fourth, his lead topped three minutes, and behind the field puncture victim Lambert was almost a minute down yet later to fight back to the bunch. On lap six the lead reached its maximum 3-45, but of course the bunch was not yet chasing. Bernard Hinault of France stopped to change bikes, retied his shoe-lace and had a sharp word with his team officials about Raas taking tow from his team-mates on the climb then caught the bunch at his leisure. The bunch had problems regularly at the feed, just after the finish each lap On several laps the crowd and the conglomeration of officials narrowed the available road so much that riders touched and crashed, but no one was seriously hurt. Near the end of the eighth lap Frenchman Duclos-Lasalle jumped away in pursuit of Hayton, closing to a minute by the end of the lap. then catching and dropping him. Hayton's effort had lasted 70 miles or more, covered at an average of 23.5mph. Maas of Holland and Italy's Baron came by, and briefly Hayton clung to them, before continuing his lone progress to be engulfed by the bunch on the Cauberg, almost eight laps after he had first attacked. Meanwhile Maas, carrying a non working Barone in his slipstream, was closing on Duclos-Lasalle, and the three came together on lap ten, with the bunch 1-24 back. The speed of the bunch was steady, and on lap 12 Switzerland's Keller crossed a 1-30 gap as the leading trio came through the finish. On the Cauberg, just before this point, Hayton had slipped out of the back of the bunch where he had clung for so long, and finally stopped, ending a courageous ride. The bunch started to move on lap 14 with the Dutch hammering away at the front, then the Belgians, with Godefroot and Verlinden prominent, taking such vicious turns at the front that in the space of a lap a 1-40 lead was annihilated. This was the lap which did the damage, and only Lambert was still with the leading group by the time lap 15 started. The last of the British survivors, now behind the bunch, were Dave Cuming a late entrant after originally being a reserve, Reg Smith, Sid Barras, Barry Hoban and Paul Sherwen. Attack succeeded attack the bunch usually in one long panting iine, sprinting up the Bemelerberg, halfway round the circuit, where they had almost cruised before. On the Cauberg Italy's Giuseppe Saronni, one of the hardest favourites beforehand, stirred it up further, stretching out the toiling bunch on the climb, then continuing his effort over the top. It did the trick, splitting the bunch in half, with two dozen or so in front and Lambert in the back half. Starting lap 16, with two to go, the second bunch were 18 seconds down, but it might as well have been 18 minutes, for at the front the strong men were making sure that this gap would never be closed. Look at the favourites among them: Hinault of France, Lubberding, Raas Knetemann, Zoetemelk of Holland, Thurau and Braun of West Germany; Moser, Saronni and Battaglin of Italy; De Vlaeminck and Willems of Belgium and even Ireland's Sean Kelly. 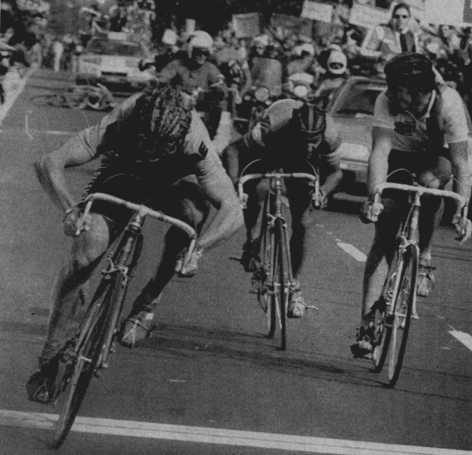 Knetemann, Hinault, Battaglin, Norway's Knut Knudsen, put in raking turns at the front, the Dutchmen particularly dangerous as they attacked in turn. A left turn of the narrower section of the circuit, with 27 kilometres to go, and the group split again under the impetus of Thurau, who took with him Raas, Lubberding, Knudsen, Willems, plus Frenchmen Chalmel and Bernaudeau, and Italy's Battaglin. There were enough stars in the break to succeed, as the Italians, Belgians, Dutch and French blocked behind. The race was between these eight. On the descent into Valkenburg, with just over a lap to go, Raas was looking for a bike change hoping to get a machine with a 12-tooth top sprocket But the commissaire wouldn't allow the change, since only punctures merit the attention of a service car, all other breakages having to be taken care of at a pit. So at the bell Raas forgot his 12 sprocket, and the group started a last lap knowing that the nearest chasers were almost three minutes behind and not really chasing. Halfway round the last lap Willems was worried about a softening rear tyre but wouldn't risk a change at this late point. Up the Cauberg for the last time Lubberding led, giving it everything to draw the sting of the other sprlnters for the benefit of Raas, then pulled over to let the rest through, with Thurau tight on the rear wheel of Raas. With 1,200 metres to go, all of them flat out, Knudsen had this enviable position but looked behind at the wrong moment, touched the Dutchman's wheel and fell, bringing down Willems too, the Belgian taken off with a suspected collar-bone fracture. This was the least of Raas's worries, however. Inside the kilometre flag Chalmel stole away. Thurau watched the Frenchman go, Raas watched Thurau, Battaglin and Bernaudeau watched the rest and did nothing. Chalmel's effort was taking the gamble of a man whose time was running out, but he looked to have won. Thurau finally speeded up down the left-hand gutter with Raas, Battaglin and Bernaudeau behind him, but perhaps too late? Chalmel's effort died away, his legs leaden, and suddenly France had lost the rainbow jersey. The Thurau train swept by on the left in the last 200 metres and forgot him. Then Thurau switched hard to his right, gutter to gutter, a vicious move which would have earned him disqualification at any other time. But Raas saw it coming, and when he reached the right-hand gutter Raas had already jumped past for the title, going through the door before it closed. Battaglin had touched Raas's wheel and went sprawling, later being almost pushed across the line, with Knudsen coming in just afterwards. Three minutes down, Saronni won the sprint for eighth place from Kelly, with Lambert in the main field almost seven minutes down. It was all over bar the shouting, but shouting there was, Raas took the jersey, but it was hours before the commissaires rejected the Italian protest and the Dutchmen could settle in the knowledge that the world title still belonged to them. 2 Dietrich Thurau (West Germany) s.t. 3 Jean-Rene Bernaudeau (France) s.t. 10 de Vlaeminck (Bel) s.t.